Imagery coverage map from a daylight SAR (recovery) mission in difficult hilly terrain. Each numbered symbol depicts a photo captured at that location. In September 2016, AlphaPixel was contacted by an individual requesting mapping services in support of a Search and Recovery mission for a family member who had disappeared in our region in July. At the time of the disappearance, law enforcement and Search and Rescue teams had searched the area, but had not found anyone and the family of the missing party wished to gain some closure by locating the remains of the missing person. Along with fellow local UAV operators DT Aerial ( http://www.dtaerialphoto.com/ ), Armando Martinez Photography ( http://www.armandom.com/ ), and Cloudbase Aerial Media ( http://cloudbaseheli.com/ ), we executed an all-day aerial search of the areas indicated by our client, specifically a number of hard-to-reach steep and rocky slopes and areas covered by thick vegetation near the Point Last Seen. 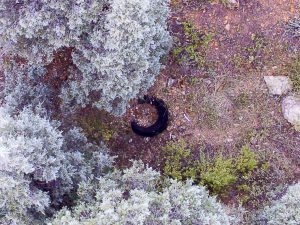 The aerial perspective of the drones enabled us to look down into concealed spaces and inaccessible terrain. We captured georeferenced photos and high-resolution video from DJI Phantom and Inspire aerial platforms. 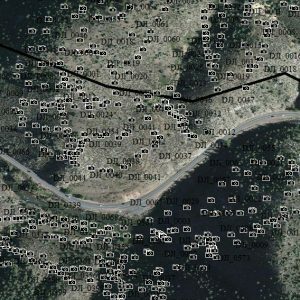 AlphaPixel provided GIS/mapping capabilities as well, gathering and indexing the data as each flight landed, and mapping which areas were covered and which remained to be examined. Post-mission, we thoroughly reviewed all acquired footage and photos to ensure nothing was missed during the flights. 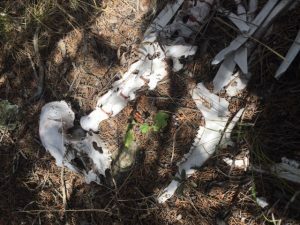 Remains discovered from aerial search during SAR operation. Forensics determined these were not human. AlphaPixel also returned to the scene on following days to complete coverage in areas of particular interest and investigate and document the many promising targets that were discovered while reviewing the footage, and coordinated with a Forensic Anthropologist to determine they were not human remains. None of the probable targets were discovered to be human remains, and the entire target area proposed by the client was eventually cleared. Non-human remains discovered by drone mapping. AlphaPixel proposed the client contact the Colorado Forensic Canines organization ( http://www.findthelost.org/ ). During the course of several missions, CFC explored further from the Point Last Seen and successfully discovered the remains of the missing party outside of our search area. AlphaPixel offers SAR mapping at no charge within our reasonable service area, please contact us if we can help.